This cool country party sign and decorations didn't come from a magazine cover, but are the brain storm of my genius nephew. You can see more about our family team on the "About Us" page. 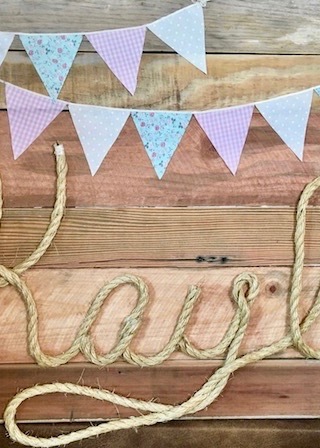 The possibilities are endless with this fun country party sign. 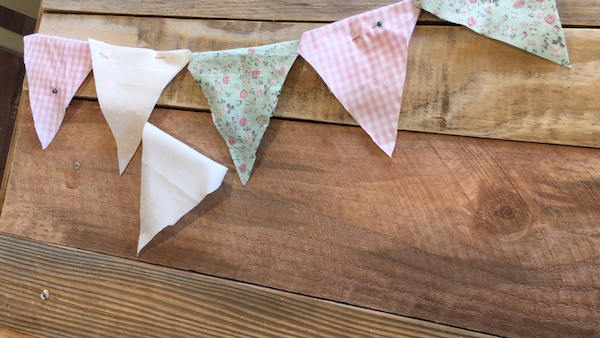 Change the colors of the flags for a wedding, picnic, or a decoration in the yard. 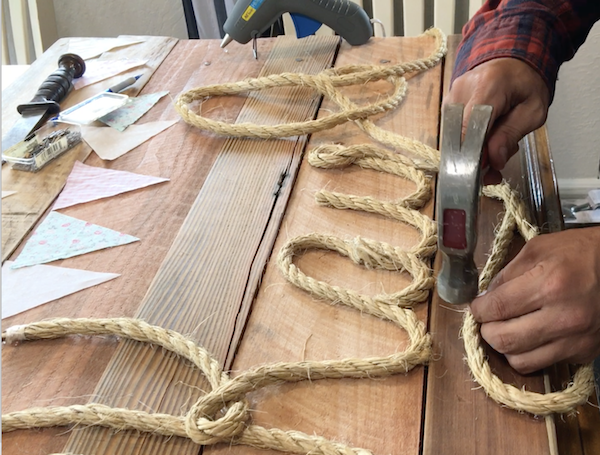 Spell out whatever you like with a larger or smaller rope, or use something other than a rope. 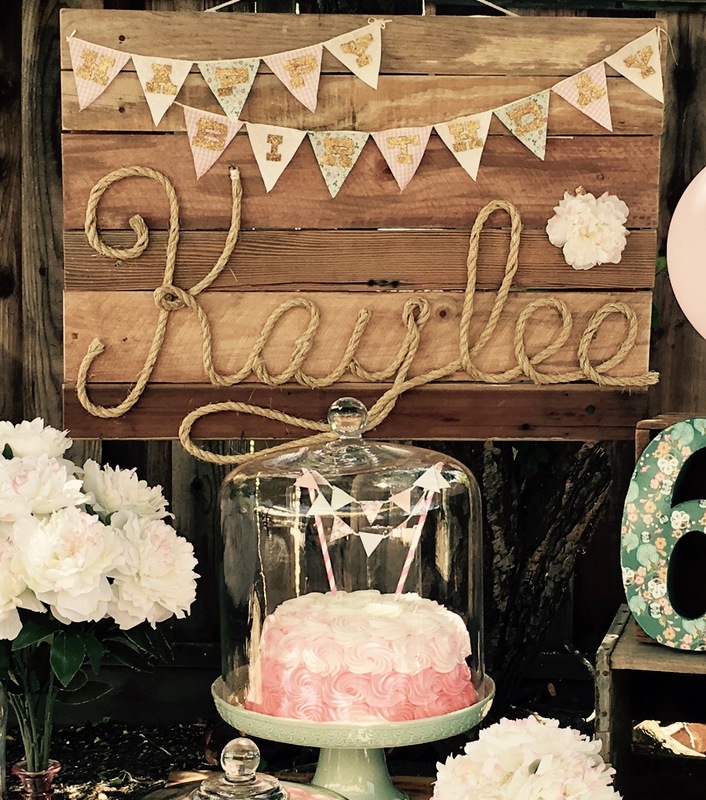 Use real flowers, fake, vines to spell out "Welcome" or whatever works. 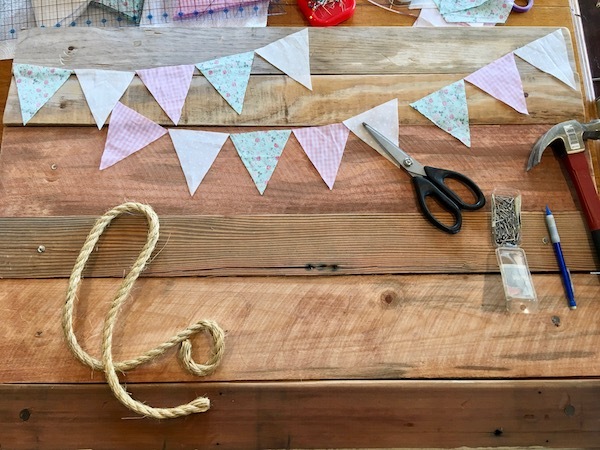 Attach personal items like horse shoes, hearts, photos. Whatever works! And did you notice the adorable flag banner as a cake topper on this grocery store bakery cake. SOOO cute! 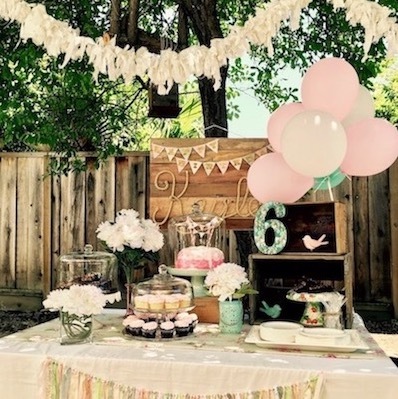 The flag fabric on the sign fabric, the invitation, and some of the overhead garlands coordinated. too. . For the white garland in photo below, check out "How to Make Party Decorations"
Sketch First we drew out what we had in mind. In our original drawing (photo below), there were no flags. This drawing is way more fancy then necessary. Just a simple sketch will do. 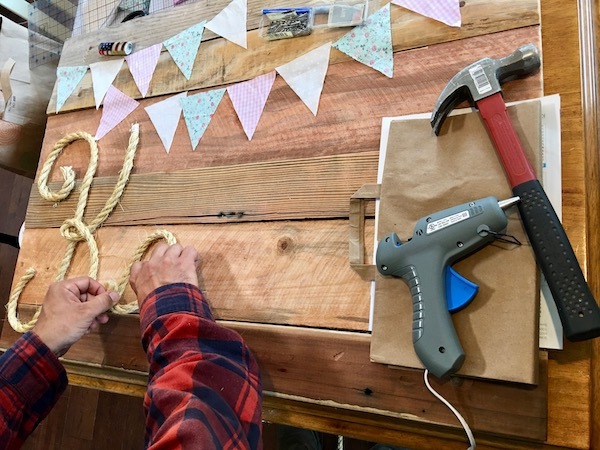 You'll Need A pallet, rope (we used 5/8th of an inch thick rope), scissors, hammer, small long nails (long enough to go through 2 thicknesses of rope). Fabric for flags, and ribbon or string to connect the flags. 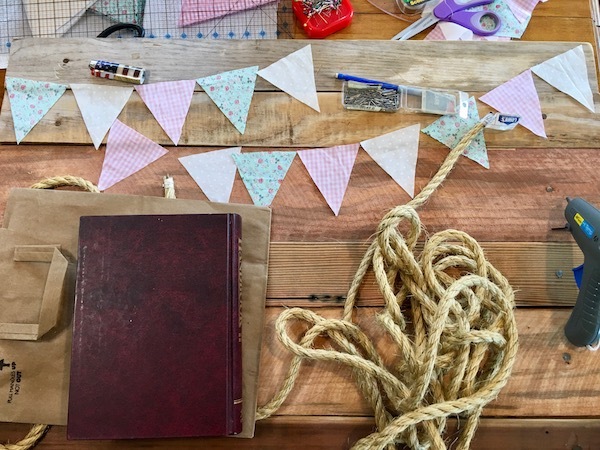 You'll also need a hot glue gun and something sharp enough to cut the rope. We used a knife, but sharp scissors may work..
Cut Out Flags We started with the flags so we could lay them out on the pallet before gluing down the rope. We made 13 small flags, which would require very little fabric. Scraps of fabric, old clothes, sheets, etc could definitely work here. We traced the flags by making a pattern out of cardboard from a cereal box. We made enough flags for 2 coordinating 10- foot banners, but that's another page. 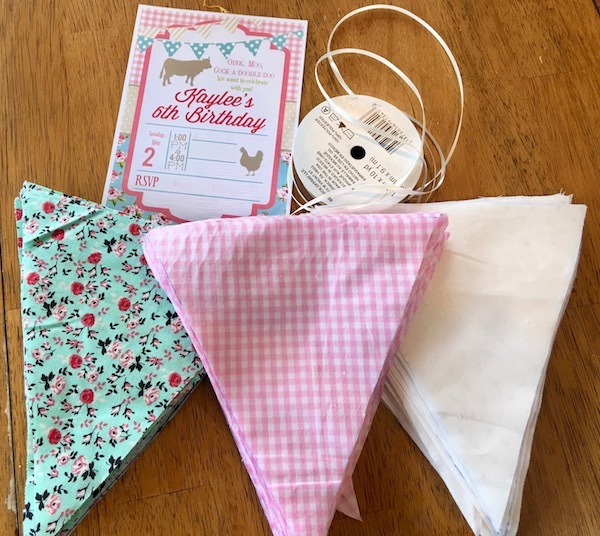 "Make Party Decorations"
Sew the flags together using a ribbon to connect, or if you prefer no-sewing, just glue the flags and ribbon directly on the pallet.. Arrange the flags before laying down the rope. This would be the time to experiment with placement and angles. Rope Some suggest soaking the rope to make it relax, but we didn't, and just went for it and it worked out. Rope Cutting The first letter is a "K" so we estimated what it would take and cut the rope accordingly. Lettering After some experimenting with placement of the rope, we cut the rope after the "K" was layed out. Then started the "a", connecting the two with hot glue. Just takes some patience and time. 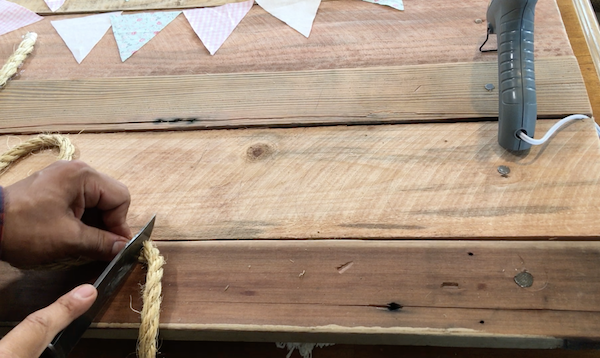 Use the nails and glue as needed to hold rope in place. After glue and nails are used on a letter, place book (as shown below) to hold in place until dry. The final stages of the rope are being placed. 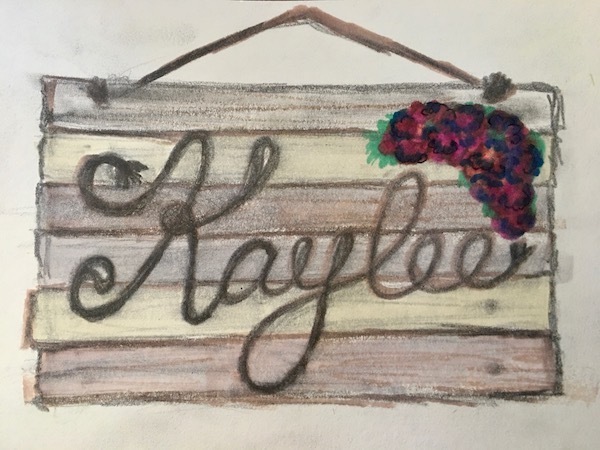 We're using the "y" in Kaylee to underline the name. To do this we tacked down the rope with the nails in a couple places. Anywhere the letters crossed we used a nail as well and the hot glue. Once done, glue the flags down. 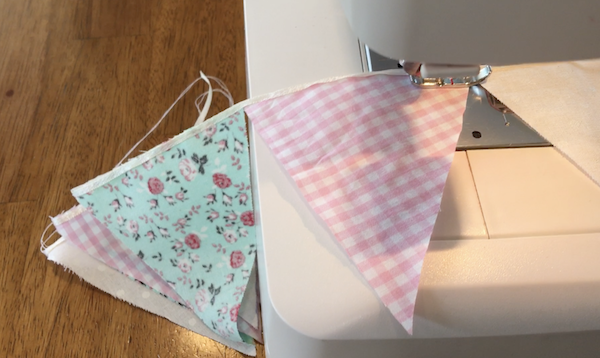 We choose to sew them to the ribbon, then glue the ribbon to the country party sign, but gluing the flags and ribbon with no sewing would work great too. Glue only the top so there is some movement in the flags. and there you have it! This sign was a hit at the party!